This option gives you the entire log in details. It shows up any failed log in details or correct log in attempts as well. You will have to select a date range and you get to know who has tried to log in and whether he has given any incorrect log in details or not. This tab helps you to delete the access logs. You can select the date range and can delete if you want to. Note: deleted logs cannot be recovered. 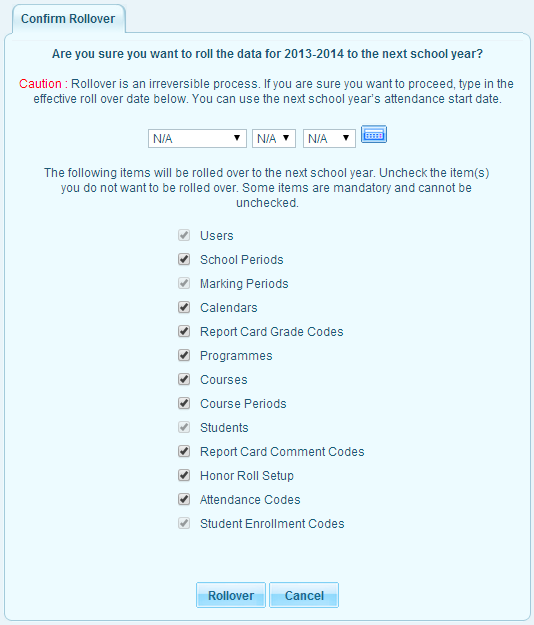 This tab allows you to roll over the entire database of a school to the next school year. It will ask whether you are sure about rolling over or not if you select yes it will be rolled over automatically and you need to log in to the system again. Roll Over is done once at the end of every academic year. Roll Over moves your setting to the next academic year for example students in (form 1A) class who deserve to be promoted based on your configurations will be promoted to the next class (form 2A), you have the option to select the option to be moved. Caution : Rollover is an irreversible process. If you are sure you want to proceed, use this option carefully. You can use the next school year’s attendance start date. This backup utility will create a backup of the database along with the database structure. You will be able to use this backup file to restore the database. However, in order to restore, you will need to have access to “Restore Database” utility in hapasis or you can use MySQL administration application like phpMyAdmin and the root user id and password to MySQL. This restore utility will help you to restore the database with a previous backup created using the “Backup Database” utility. To restore a backup, click on “choose file”, browse and pick the backup file, Click on “Restore Database”, after a few minutes your database will be completely restored .